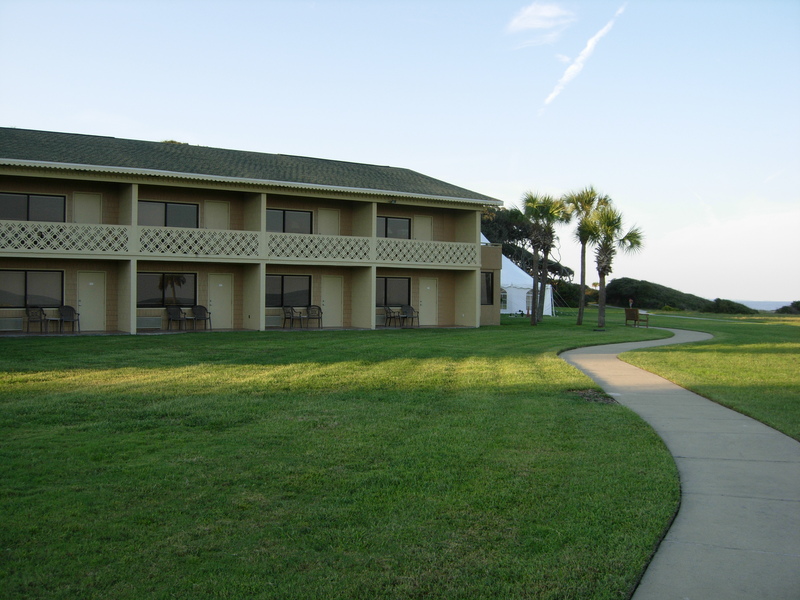 The Oceanside Inn and Suites on Jekyll Island will be gutted this summer to make way for a Holiday Inn Resort. Oceanside Inn and Suites, near the northern end of Jekyll Island, Ga., is a dated, at times dilapidated, somewhat threadbare old motel. 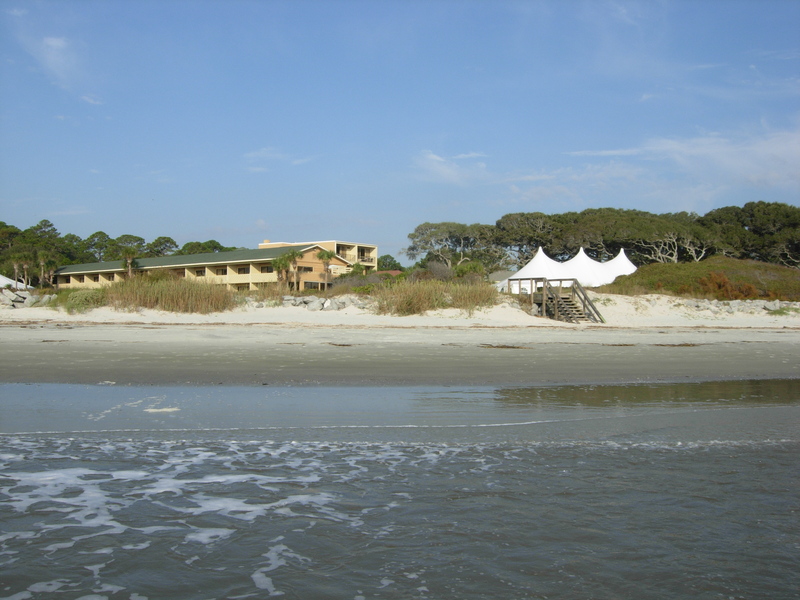 Built in 1958 as the Wanderer, the resort is a vestige of Jekyll Island’s roots as an affordable beach destination for Georgia’s families. It was old – as many properties on the island are old – but that added to its charm: unassuming, quietly distinguished, timeless. My wife and I discovered Oceanside Inn and Suites a year after we married. We’d been to Jekyll together once before, staying in a small condo at Villas by the Sea for a long weekend. Tight finances precluded us from taking a honeymoon just after our wedding, and so for our first anniversary, we saved up some coin and booked ourselves a beach vacation on our beloved Jekyll Island. One of the last examples of affordable beach vacations for Georgia’s families — the Oceanside Inn and Suites — will be stripped to its concrete bones and reborn by Spring 2014. For a price that I recall being surprisingly affordable, we booked a lanai suite at Oceanside, complete with a king-sized bed, a couch, table and chairs, television, balcony overlooking the ocean and an in-suite hot tub big enough to accommodate at least six people. On our anniversary, the staff brought a bottle of champaign and a box of chocolates to our room, all complimentary, being touched that we were celebrating the occasion at their property. Several more trips followed. (In fact, according to my wife’s calculations, we might even have conceived our 4-year-old daughter there.) Some were more magical than others. One year, the bugs were particularly bad. Another was windy and cold most of the time. The thing about Jekyll Island is, there’s not a helluvalot to do there. There’s a beach, and the hotels and motels have swimming pools. There’s a liquor store and an IGA for groceries. There are some pretty nice, flat bicycle paths (if you’re into that sort of thing), and the historic Millionaires Village is beautiful. There’s also a water park, again, if you’re into that sort of thing. A few restaurants. That’s one reason I like it so much; I get to relax without feeling like I’m missing anything. It’s a slow and easy vacation, with plenty of time to sit by the ocean – the real ocean, none of this Gulf of Mexico crap – and read. At dinner time, go find a place to eat fried shrimp until you’re sick. It’s great, really. That is changing, with the island’s new convention center opening and hotels starting to slowly take notice after years of polite disregard. A couple of the grand old resorts already have been torn down, and one new hotel, a Hampton Inn, opened on the island in the last few years. New properties and new life on the island is good news for the Jekyll Island Authority, which administers the island and must do so with no financial support from the state (the state having since gotten out of the “affordable-beach-vacation-for-Georgia’s-working-poor” game). It means there will be more revenue for more improvements to draw more visitors to make more revenue. 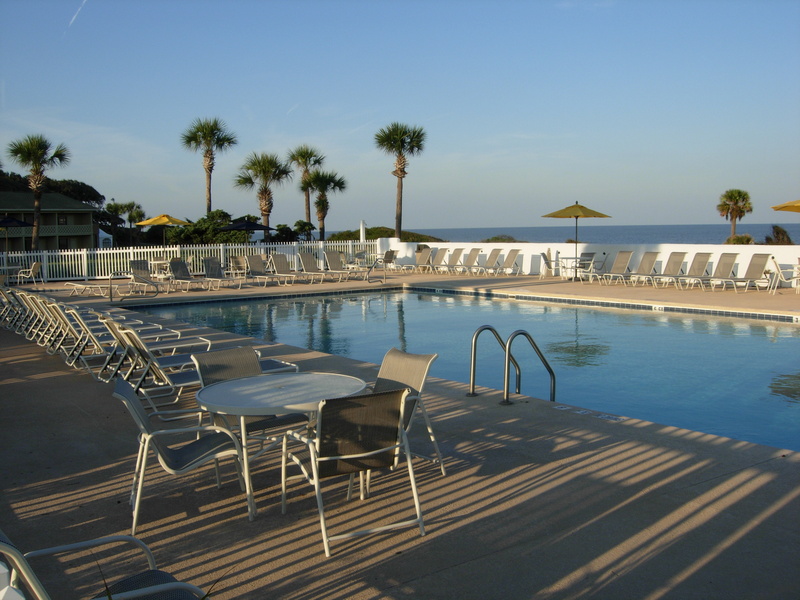 The pool at the Oceanside Inn and Suites on Jekyll Island, Ga. It also means that people like me – albeit a minority – who enjoy a cozy older venue that harkens back about two generations and offers pretty wonderful amenities at a reasonable price will be left without much reason to go to Jekyll Island anymore. The Oceanside Inn and Suites went above and beyond to make us welcome. It was not pretentious, it was not elegant. It had free Wi-Fi, and that was awesome, and a hot tub in a room that overlooked the ocean. You could sit on the balcony of your second-floor suite and watch the sunrise. Sometimes, you could see dolphins in the distant waves. You could get drunk and stumble over to the Sandbar and Grill for a bite to eat. You could have beer for breakfast and make a baby. It was pretty awesome. I’m sorry to see it go. I’m sorry that I’ve likely spent my last night there, and I’m deeply sorry for the staff who have always been so good to my wife and I, and to our daughter who stayed there with us the last time we went and swam in the six-person hot tub in our lanai suite. The last time we stayed, the rooms had been refurbished, the carpet and furnishings were clean and new, the swimming pool was a spotless blue, the grounds were meticulously maintained and the property looked every bit to have a bright future. In August 2013, it will be gutted to its concrete skeleton and remade into a 155-room Holiday Inn. It won’t be nearly the value it was, and the patina of that neat old 1950s motel will be scrubbed away. It won’t be the same. I hope, however, that it will at least have a lanai suite, on the second floor, with a view over the dunes to the ocean beyond, and a large hot tub and balcony. I hope the people who work at Oceanside Inn and Suites will have a place with the Holiday Inn, and maybe be making a little more money than the Oceanside could pay. I wish you the best, and thank you for the fantastic memories. Hi Tony! As an employee of Oceanside Inn and Suites and a fan of the laid back atmosphere of Jekyll Island, I loved reading your post. You managed to sum up the nostalgia, I, and many others feel for Oceanside Inn and Suites. Thanks for sharing!